then on the recent Anza-Borrega trip, Bradywgn71 & Kaspily brought their Little Red Campfire too. there's also the Big Red Campfire which appears to be the same as its little brother just with a larger diameter. here's a photo from Kaspily showing Lichen's foldable leg version in the foreground and the Little Red Campfire behind it. i think the Little Red Campfire's bottle was nearly empty in that photo, so it's not a true comparison. 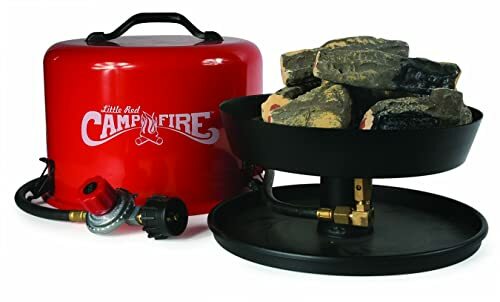 the Red Campfires have ceramic fake logs to help radiate some heat whereas the other Camco product includes natural lava rocks for that purpose. the folding-leg version seems to produce more individual flames while the Little Red version can really put out a few tall flames when cranked all the way up. 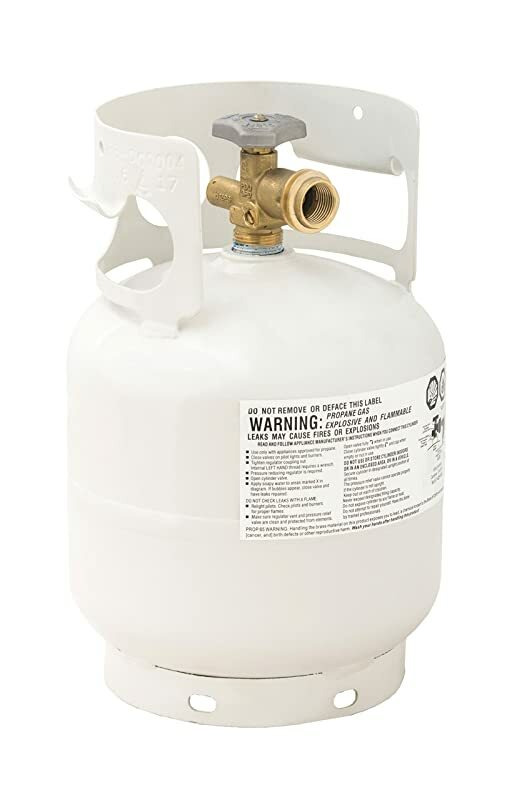 all the products i mentioned come with connectors meant for the standard 20lb propane tank, but will run on the little green 1lb disposable cylinders with an adapter. in online reviews, some folks reported getting up to an hour with those 1lb bottles. our experience has been that if it's below 60*, the bottle can freeze up after 30 to 45 minutes. putting the bottle in a decent sized pot of water may get you the full hour but will freeze the water with the bottle stuck in it. all three products are adjustable and all are rated at a maximum of 65,000 BTU/hr. the Red Campfires have a somewhat traditional regulator with the adjusting knob built into it. the folding-leg campfire has the adjuster after the regulator. 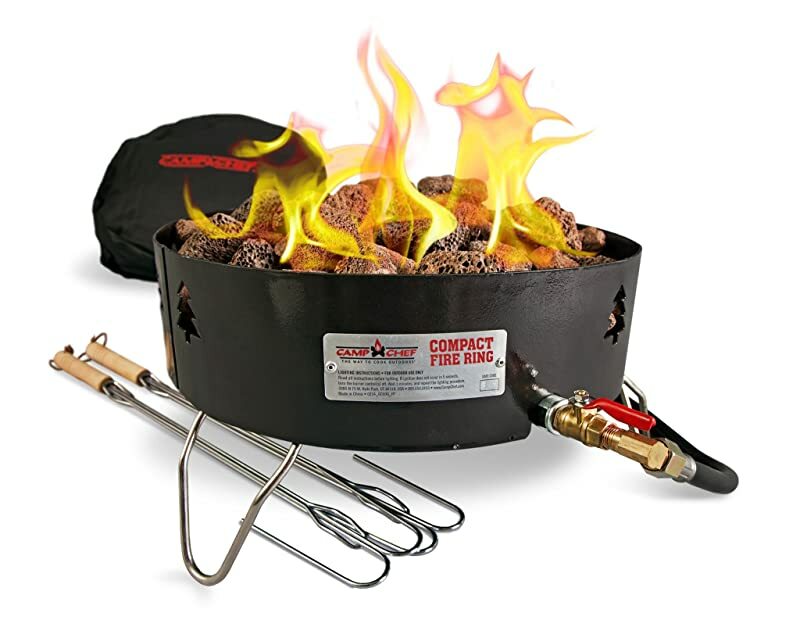 i'm considering buying a Little Red Campfire myself, along with this Coleman Gemini Powerpack dual bottle adapter. 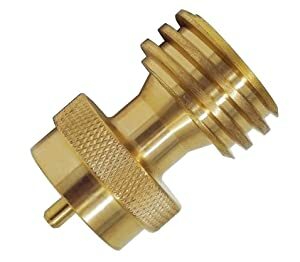 this should help with the freezing problem and also has a standard larger tank output on it so i wouldn't need the other adapter i mentioned. of course a refillable larger bottle is the best thing, but sometimes it's hard to find time to get everything ready before a trip and so being able to pick up the small bottles is handy. i could probably find room for something like a Viking 11lb composite tank, or even a standard steel tank in 4.5 or 5 pound size. the biggest problem with these, besides space to store the device and propane, is the amount of heat they put out. on high they work fine for a very small group, say 10 or less people... but if the circle gets much bigger than that you're not going to be able to feel the heat from several feet away. besides having a fire during a ban though, IMO the best thing about a propane campfire is not smelling like smoke at the end of the night. sure there's something alluring about the smell of a real campfire, but having your clothes, sleeping bags, and tent all smell like smoke can get old - especially if you have allergies. Last edited by theksmith; 05-08-2018 at 05:24 PM. Cool updates. We ran ours at about half capacity during our Death Valley trip and could get about 2 hours in 50 degree temps. These really are more for firelight and not warmth. Can't crank them up unless you want to haul the big propane container. It was so wonderful to still have a campfire even though they were prohibited last weekend. I agree the propane campfire products don't produce as much heat as a standard campfire, but I also enjoyed my hair and clothing not smelling like smoke, too. Now that you mention it, I usually have a rough voice and nasal problems day after a campfire, and I didn't experience them with the propane campfires. 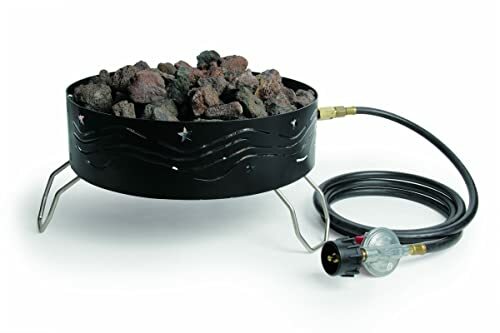 Lichen actually has the Camp Chef portable campfire, not the Camco. they both have fold-up legs and are pretty similar except the Camp Chef has the adjuster next to the fire instead of at the regulator and has a slightly lower BTU rating. i recently heard of the QuikFire propane campfire, which folds down to compact package and the company seems to be here in the Southwestern US. the QukFire doesn't use lava rocks or fake ceramic logs for looks, it's just a bare-bones flame-maker! also, i purchased one of those Coleman Gemini Powerpack dual bottle adapters and we tried it with Braywgn's Little Red Campfire on our Salt River trip this weekend. it did last longer of course than a single bottle, but both cylinders started to freeze up once the propane got down to maybe the last third of each bottle. Worthington also makes a small tank in a slightly different shape. The Flame King one is a more common size/shape and so there are mounting brackets available for it, and it comes pre-purged which will save you some time and possibly money the first time you go to fill it. and just to geek-out for a minute... if you're interested in why the little bottles freeze up so fast, it has to do mainly with the concept of "wetted surface" which is how much of the metal container the liquid propane is in contact with. wetted area (determined by container size/shape and current fill volume) along with ambient temperature are the primary factors that influence the vaporization rate. if you felt like doing some math, you could calculate the exact BTUs that a single throwaway cylinder would support at any given temperature and and fill level. Last edited by theksmith; 05-09-2018 at 06:29 AM. good point about checking the details of your area's restrictions!